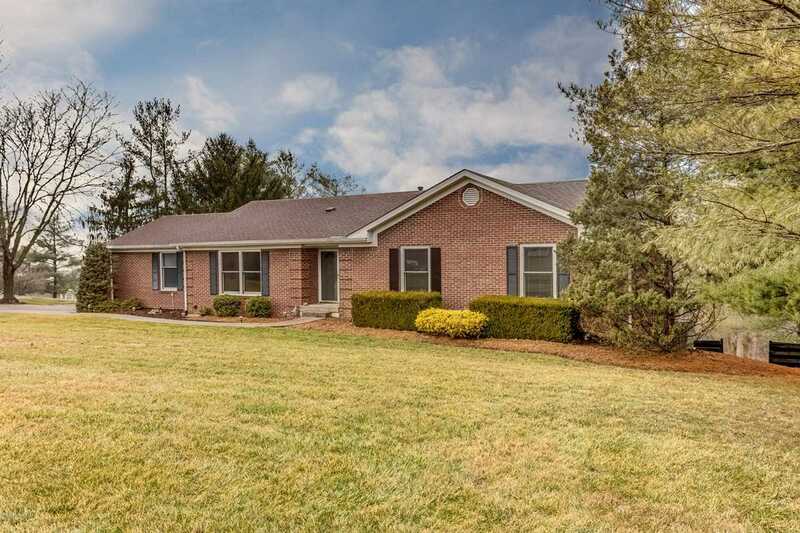 Welcome home to this beautifully updated, meticulously maintained brick ranch in the heart of Oldham County! Nestled on a sprawling 1.64 acre lot and conveniently located only minutes from I-71, this 3 bed/3 bath home will give you the best of both worlds. Neutral colors, hardwood flooring throughout most of the main level and countless updates make it move in ready! The vaulted great room has a low maintenance gas fireplace, recessed lighting and access to the dining area, kitchen and rear deck. Not a detail was overlooked in the complete renovation of the spacious gourmet cook's kitchen with solid cherry cabinetry, granite countertops and convenient peninsula breakfast bar with overhang for seating, reverse osmosis system, plenty of pantry space and GE Monogram stainless finished appliances (including an Advantium wall oven, warming drawer, gas cooktop with center griddle and range hood with heat lights and warming shelf). You won't ever complain about cooking at home again! The luxurious main level master suite has a trayed ceiling, his and her walk in closets with built in organizers, great views of the rear yard and a gorgeously updated private bath complete with granite countertops, double bowl sink, water resistant teak flooring and an oversized tiled shower w/ a rainfall shower head and convenient granite shower seat. Getting ready to start your day will become a pleasure! Also on the main level are two additional bedrooms  both with walk in closets  and an additional updated full bath with granite countertops, a granite tiled shower and teak flooring. Not enough? Come see the finished walkout lower level. Enjoy movies and quality family time in the theater room complete with a projector, 110 inch screen, surround sound system and electric recliners . The lower level family room, currently being used as a game room, has a built in bar area w/ sink, beverage refrigerator, ice maker and accesses the rear patio where you can relax in the hot tub complete with a canopy covering. An additional lower level room w/ a private updated full bath and a walk in cedar closet would make a perfect guest/teen/in-law suite. A large laundry room gives you plenty of space to work and also has a handy soaking sink. The 2 car garage conveniently leads right into the main level kitchen area and has high ceilings for extra storage space. Entertain outdoors on the expansive rear deck with a retractable awning and convenient natural gas plumbing to grill. No more running out of propane while you are grilling! Enjoy the spectacular views of the private rear yard with plenty of space to play and with two outbuildings that are perfect for storing lawn equipment and outdoor toys. This home is better than move in ready! See documents for additional updates and features. Seller offering one year home warranty. Come see it today! Directions:I 71 N to Exit 18, right at end of ramp onto Hwy 393, left at 'T' onto Hwy 22, left onto Centerfield Dr, left onto Worth Rd to house on right. SchoolsClick map icons below to view information for schools near 2605 Worth Rd Crestwood, KY 40014. Real estate listing at 2605 Worth Rd Crestwood, KY 40014. Description: The real estate listing at 2605 Worth Rd Crestwood, KY 40014 with the MLS# 1524195 is currently listed for $337,500 and has been on the Crestwood market for 75 days. You are viewing the GLAR MLS property details of the real estate listing at 2605 Worth Rd Crestwood, KY 40014, which is located in the Meadow Creek Estates neighborhood, includes 3 bedrooms and 3 bathrooms, and has approximately 3000 sq.ft. of living area.